It’s interesting to consider Steven Spielberg’s first five movies together, because while his technical proficiency grows by leaps and bounds, his interest in character steadily declines. Perhaps the first doesn’t necessarily crowd out the second, but it’s a distraction, at least. Raiders of the Lost Ark, conceived with George Lucas, is the ultimate pulp homage by two men who see movies as a funhouse and little else. Raiders of the Lost Ark was finished ahead of schedule and under budget, a first for Spielberg. He seems to have known exactly what he intended, then captured and delivered it with startling confidence. Almost every shot at least references another movie, while many are lifted directly. Michael Kahn’s editing, on his third project for Spielberg, seems to be an extension of the director’s mind at this point. For once, John Williams’ music doesn’t overwhelm the proceedings – rather than ask Williams to tone it down, Spielberg ramps everything up to the composer’s level. Each component of the production seems machine-tooled to thrill, and everything dovetails beautifully; unlike 1941, it succeeds more than it fails. Still. OK. Raiders of the Lost Ark wants to excite me, and it does, but I miss the human spirit of Close Encounters, and The Sugarland Express (1974). The body count in Raiders is appallingly high, grotesquely high, given that it’s all supposed to be in fun. The hero blithely dispatches anybody who gets in his way, and we’re not disturbed by those who get shot or impaled or run down or poisoned or melted by the wrath of God. I wonder at the erosion of my spirit by “entertainments” such as this. 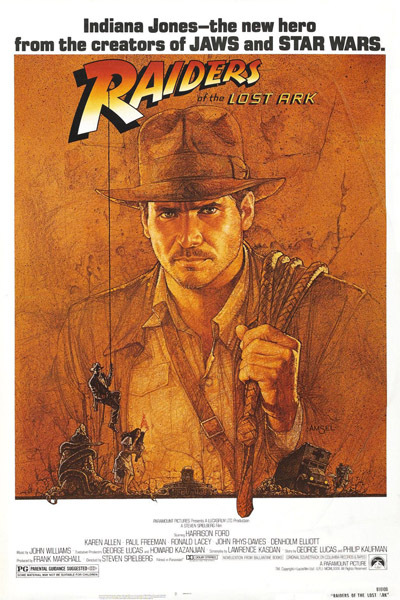 I first saw Raiders of the Lost Ark on a giant screen in an old movie palace in Lake Placid, NY. I’d read everything I could about the movie before it came out – fanzines, comic books, even Newsweek (I still have that copy.) 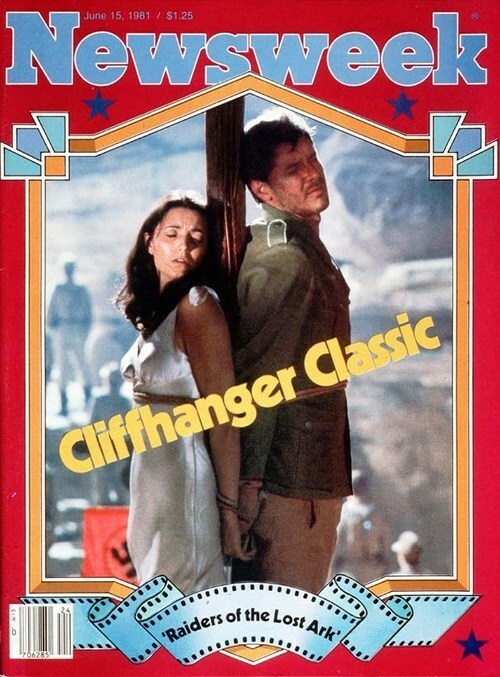 I’d never seen the old serials that Spielberg copied, often on a shot-by-shot basis. (Spielberg says he “didn’t think” while shooting Raiders; based on the evidence of side-by-side compilations from people with too much time on their hands, he might not have.) The movie really is like a ride at Disneyland – in a sense it damaged my expectation of what a movie should provide (it certainly damaged any number of filmmakers and studio executives, and has arguably contributed to the ruination of the summer moviegoing season.) I still remember the impact of being swept along by the images and the music, the smell of popcorn in the air. We’d gone to the movies that night because we’d been camping, and it had been raining. My father was eager to see Raiders, having provided most of my reading material leading up to its release. I knew there were parts I had to prevent my brother from seeing: dead bodies impaled on spears, tarantulas, snakes, and especially the melting face near the end. I mis-timed my hand in front of his eyes, though, because he saw that face melt. Later, in our tent, the rain pelting just inches above our heads, my brother succumbed to the horror of that face. Fueled by the popcorn and candy he’d eaten, he vomited on my sleeping bag. That’s when I smelled it. Then I put my hand in it, as I felt around in the dark for the flashlight. He’d fallen back to sleep. Now I was feeling sick. I found my shoes and left the tent, walked through the rain to the picnic table, which was somewhat protected by a tarp. That’s where I stayed until morning. Remnants of the Last Puke. As I recall, we had to stop the car on our way back to the campsite to allow your sister to get sick, too. That face-melting scene was powerful stuff.